Are you scouring the internet for a modern Fire Pit to complement your home's contemporary style? 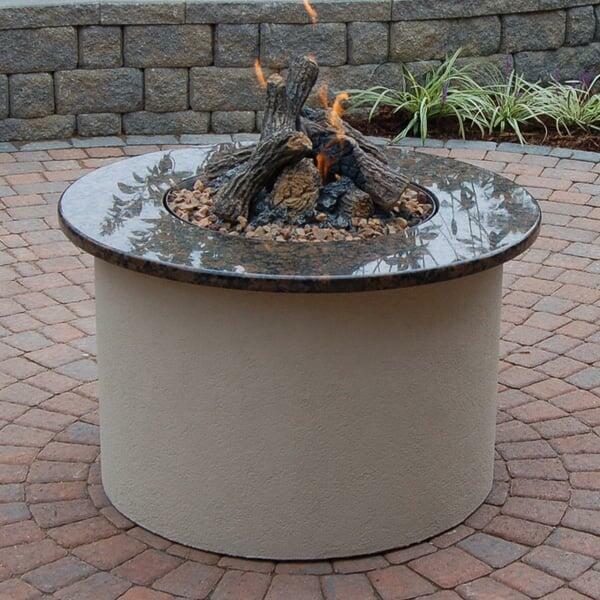 The "Lynch" Outdoor Fire Pit Project offers an attractive fire pit design in your choice of stucco and granite, allowing you to customize the fire pit to your exact needs and wants. Do you have an Outdoor Room, porch or patio that could use a centerpiece? This fire pit is great for entertaining friends and neighbors, giving them an area to warm up and socialize. The "Lynch" Outdoor Fire Pit Project showcases a contemporary, circular design with stunning stucco and granite guaranteed to impress the most fickle guests. Imagine conversations by the fire with visitors, or soaking up the atmosphere, sipping wine, after a long work week. With the "Lynch" Outdoor Fire Pit by Leisure Select everything is possible. Contact us today and ask about this fire pit project! The quality of materials and craftsmanship that goes into every stone or stucco fire pit is what separates our products from other similar looking designs. Each piece of cultured stone is hand selected based upon size and color and is placed accordingly during construction. When stucco is used, only the top grade Pare 100% acrylic finishes and coatings are used ensuring a tough UV resistant skin that is pliable, vapor impermeable and wear resistant. The internal frame is constructed using aluminum studs that are extremely durable and rust proof.